I've blogged about the Chicago Public Schools (CPS) before, mostly as it relates to the smarmy Jonah Edelman and his scheme to use extremely wealthy people's money to buy himself enough seats in the Illinois Legislature to screw over teachers. This is just one aspect of a larger war on the Windy City's educators, spearheaded by the profane and insufferably smug Mayor Rahm Emanuel, and abetted by the reliably sycophantic Chicago Tribune. Last month, Chicago was in the national education press again, this time over the antics of the Noble Street Charter School Network. Noble was changing its students monetary fines for small infractions like chewing gum; they had collected literally hundreds of thousands of dollars from students in this bizarre discipline plan. For my own part, I retweeted a few stories about Noble and moved on, thinking this was nothing more than yet another wacky anecdote about the silly things charters do that could never be replicated in the real world. I've got plenty to worry about here in Jersey, so I didn't give this too much more thought - until I came across this video. Watch it if you must, but I'll warn you: this is one of the most biased pieces of propaganda I've yet come across in the reformy debate, and that includes The Cartel. Skip down if you'd rather just get to the heart of the matter. Wow. Didn't Juan Williams used to be a journalist? Noble says: "With a student population that is 98% minority and 89% low-income, we are committed to serving the students with the greatest need..."
In the video (22:40), Williams reports that the graduation rate for Noble is 99%, while the rate for CPS is 56%. Also in the video (25:15), staff at Noble claims they do everything they can to retain students through their 4-year careers. Noble boats of a 3.1 score advantage over the CPS schools on the ACT (the ACT has a highest possible score of 36 points). This is the breakdown of the demographics of both the Noble Charter Schools and the entire Chicago high school student population, using the NCES Common Core of Data (see my technical note below for more info). The difference is striking: Noble has a far greater population of Hispanic students, and the rest of the CPS high schools have a much larger black population. 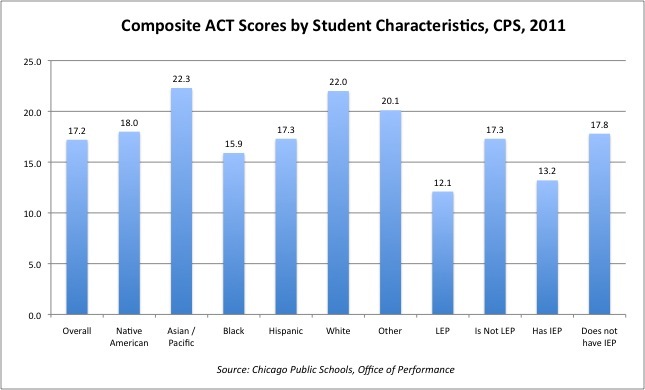 These numbers come from the CPS Office of Performance; the ACT scores are reported for the entire city. Every 11th grader in Illinois has to take the ACT; it's the standardized test for high school achievement in the state. In 2011, 23,523 CPS juniors and seniors took the ACT, so we've got a nice big sample from which to draw some conclusions. There is a difference between the scores of Chicago's Hispanic and black students. I have no expertise in the ACT, so I can't say whether it's statistically or practically significant, but there is a difference. 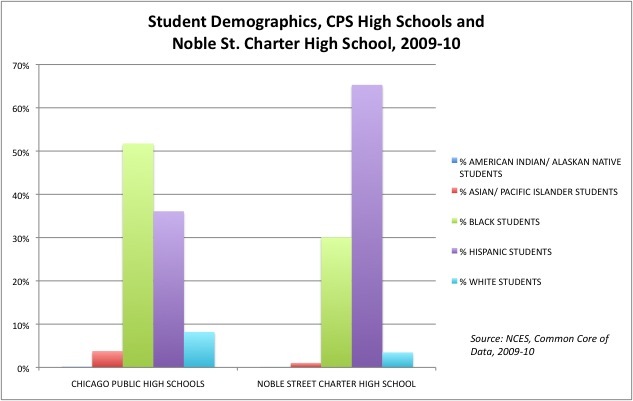 It's also a fact that Noble has nearly twice as many Hispanic students relative to the rest of the CPS high schools, and Noble has less than three-fifths of the relative black population of CPS. It doesn't much matter how Noble's student population came to differ from the rest of the district; the fact is, it did. Isn't this germane to the discussion? LEP stands for "Limited English Proficiency": students who are still working on learning the language. IEP is "Individualized Education Program"; the children given this classification have special educational needs. Obviously, students who are IEP or LEP are going to struggle more on a standardized test; obviously, schools with fewer IEP or LEP students are going to have higher test scores. 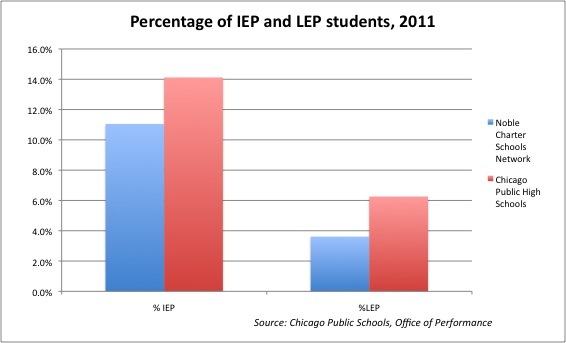 Look at that: Noble's schools have fewer kids who are IEP and LEP than the rest of the CPS schools. What does this tell us? It's beyond my scope to analyze exactly how these differences in student populations affect Noble's relative standing on the ACT. We'd have to drill a lot further down into the data to find out if Noble is "beating the odds"on student achievement; it's quite possible that they are. Their percentage of students who are economically disadvantaged (as measured by free and reduced lunch qualification) is similar to the percentage found in the entire district. I'd be curious to see what a researcher like Bruce Baker would find if he plugged Noble's numbers into one of his algorithms that account for these things. Until then, however, we can safely assume that these differences mean something. Any school that has these differences in student population is going to have an advantage on standardized tests. Further, what does it say about Noble that it has such a relatively high Hispanic population, but fewer LEP students than the district as a whole? Doesn't that mean Noble's Hispanic students are less likely to struggle with English than the rest of the district's Hispanic population? At this point in the conversation, chartery types always say the same thing: "But we don't skim the cream! We take everyone! We don't have competitive admissions! We have a lottery!" There are two problems with this: first, there are plenty of ways to influence student admissions while still being "open to everyone," starting with self-selection. Second: what happens to the kids after they are admitted? Every year, the graduating class of Noble Charter schools matriculates with around 30 percent fewer students than they started with in their freshman year. In other words, three out of ten freshman who start at Noble will leave within four years. Where do they go? Without individual data, we can only guess, but I think it's safe to say most go back into the CPS system. Maybe they stay and graduate; maybe they drop out. But since the state does not consider a transfer to another school a dropout, Noble enjoys an advantage when reporting its graduation rate that the public schools do not. Except Noble doesn't show that at all. Claiming that Noble has found the "combination to the lock" without accounting for its different student population and high attrition rate is more than foolish; it's disingenuous. Especially considering that, according to this report from NEPC, not one of the schools in Noble's network made Adequate Yearly Progress in 2011 (p.140). I say this every time I analyze a charter school, and I mean it: I have nothing but respect for the students and faculty of Noble Charter Schools. The students there are doing great work and should be very proud of their achievements. The faculty undoubtedly cares a great deal for their kids; they are to be applauded for their commitment to teaching these disadvantaged, deserving children. I'm even willing to concede that the administration of Noble may have found techniques that could help all schools. But what Williams and the film's producer, Kyle Olson, are doing here is just wrong. They have turned blind eye to some very real concerns about Noble; they should not be holding up Noble as an exemplar unless and until they address those concerns. And they certainly should not be using Noble as a club for beating the teachers union over the head. How about it, fellas? Are you willing to engage this conversation? Or are you simply content to bash the union? ADDING MORE: A great source for news about reforminess in Chicago is PURE (Parents United for responsible Education). And Chicago has some teacher-bloggers as hearty as a slice of deep-dish: Mike Klonsky remains a must-read blogger, as does KatieO. Check them all out! Noble Street suspended 51 percent of its students out of school at least once – almost 3 times the 18 percent rate of Chicago Public Schools (CPS). Although Noble Street has a lower percentage of African American students than CPS – only 30 percent in the sample – 53 percent of students suspended at least once were African American. Moreover, nearly all African American students – 88 percent– were suspended out of school at least once, compared to only about one-third of African American students in CPS. Noble Street suspended out of school 68 percent of its students with disabilities and 48 percent of its students without disabilities, compared to the respective CPS rates of 38 percent and 15 percent. These statistics clearly demonstrate a striking, systemic problem with the Noble Street discipline practices. There is more to this story, too. Stay tuned. @rweingarten @AFTunion I found two admitted socialists on your staff without even trying tonight. You're more dangerous than I thought. @Ess_Dog @jerseyjazzman Are you an AFT organizer? Technical Note: I drew from three data sources: the NCES Common Core of Data, the Illinois State Board of Education, and the CPS Office of Performance. It isn't fair to compare a high school with an entire district, particularly on measures like IEP or LEP. 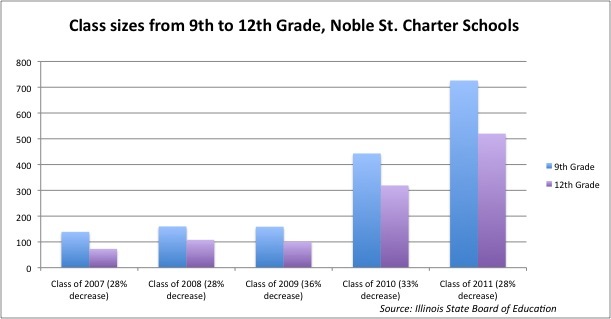 I tried here to compare Noble only to other CPS high schools, but the multiple data sources made that a bit difficult. In the CCD, for example, you can separate high schools out of the database by grade level; you can't seem to do that with the CPS data. I pulled out high schools by identifying them with a 1xxx, 7xxx, or 8xxx unit code. It seemed to work, because the demographics I could get from both CCD and CPS matched up; however, I couldn't find absolute confirmation these unit codes are correct. Further, it seems the CCD and IL DOE put all of Noble's network of schools together into a group, while the CPS data tracks each individual school. I can't vouch for the integrity of their process in doing that. Bottom line: these are good sources, but as always, proceed with caution. If anyone has further insight into Illinois or CPS data, drop me a line here. Can You Get a Tomato Pie in LA? Perth Amboy: Center of the Reformy Universe? Billionaire $ To a NJ Superintendent's Rescue! Due Process for Me, Not For Thee! "Good" Schools or "Good" Students? A Real Victory For Parents Against Reforminess! Prejudice Alive & Well in Louisiana Charters?